Following my previous post on the mechanics of ECB negative deposit rates, I wanted to back my claims about the likely poor effect of the central bank TLTRO measure on lending. I argued that despite the cheap funds provided by the ECB to lend to corporate clients (particularly SMEs), Basel’s risk-weighted assets would stand in the way of the scheme as they keep distorting banks’ lending incentives (same is true regarding the BoE and the second version of its Funding for Lending Scheme). I extracted all the most recent new business and mortgage lending rates from the central banks’ websites of several European countries. Unfortunately, business lending rates are most of the time aggregates of rates charged to large multinational companies, SMEs, and micro-enterprises. Only the Banque of France seemed to provide a breakdown. 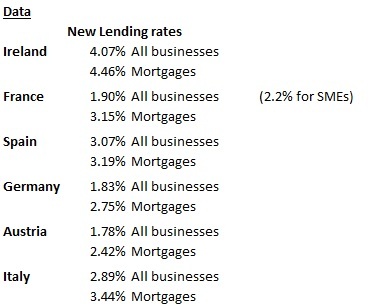 So most business lending rates below are slightly skewed downward (but not by much as you can see with the French case). I assume that all business lending is weighted 100%. In reality, apart from the French SME scenario, large corporates (often rated by rating agencies) benefit from lower RWA-density under a standardised method. This would actually raise the profitability of business lending through higher volume (and increased leverage), though not by much. Mortgages are weighted at 35% under that method. I assume that all banks use the standardised method to calculate RWAs. In reality, only small and medium-sized banks do. Large banks use the ‘internal rating based’ method, which allows them to risk-weight customers following their own internal models. Here again, most corporates can benefit from lower RWAs. But mortgages also do (RWA-density often decreases to the 10-15% range). Cross-selling is often higher with corporates, which desire to hedge and insure their financial or non-financial business positions. Corporates also use banks’ international payment solutions. This adds to revenues. Business lending is often less cost-intensive than retail lending. Retail lending indeed traditionally requires a large branch network, which is less the case when dealing with corporates (often grouped within regional corporate centres, though not always for tiny enterprises). However, retail banking is progressively moving online, providing opportunities to banks to cut costs and improve their profitability. The lower RWA-density on mortgages allows banks to increase lending volume and leverage. However, this also requires higher funding volumes. In turn, this should increase the rate paid on the marginal increase in funding, raising interest expense somewhat in the case of mortgages. In the end, even if the adjustments described above reduce the profitability spread by 10 percentage points, the conclusion stands: banks are hugely incentivised to avoid business lending, facilitating misallocation of capital on a massive scale, in particular in a period of raising capital requirements… Moreover, banks also benefit from favourable RWAs for securitised products based on mortgages (CMBS, RMBS…), compounding the effects. Central banks, regulators and politicians will find it hard to prop up business lending with regulations designed to prevent it. Excellent post, only the Business lending rates strike me as somewhat too low, but this could be skewed due to volume weighted loan tenors. In order to capture liquidity costs accurately you would have to compare maturity adjusted rates somehow.. Yes I was myself shocked by those low business lending rates. This is why I wanted a breakdown for SMEs. I picked what I believe are the most appropriate ones. But central bank reporting varies a lot. Some rates are average accross all sorts of lending, some can be just unsecured, some just 1yr+ maturity, some just Eur1m+… I tried to pick the ones that represented a larger share of the volume of lending. – Many surveys show that businesses self restrain from borrowing as they believe (rightly or wrongly) that banks would not extend credit to them anyway, and therefore aren’t included in the stats.